The Toto Drake II CST454CEFG uses just 1.28 gallons of water per flush (gpf) and removes a hefty 800 grams of solid waste, making this one of the most efficient toilets available. It also requires less cleaning than most toilets. Powerful flushing technology. 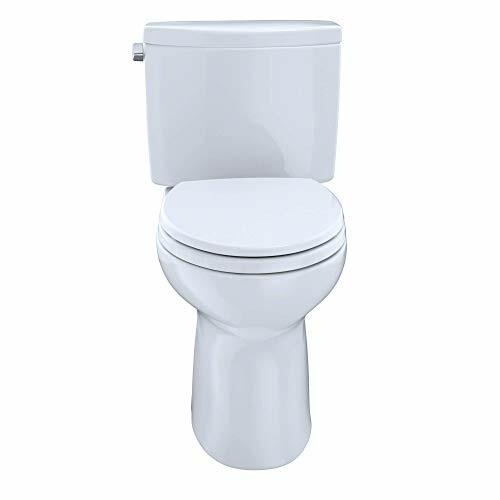 The Toto Drake II CST454CEFG is a single-flush, two-piece toilet that uses Double Cyclone technology combined with gravity to create a powerful, clean flush using a tower-flush mechanism. This WaterSense-certified toilet doesn't come with a toilet seat, but most standard, elongated seats will fit. Efficient and effective. The Toto Drake II CST454CEFG earns a Maximum Performance (MaP) score of 800, meaning it removes a hefty 800 grams of solid waste or more in a single flush. 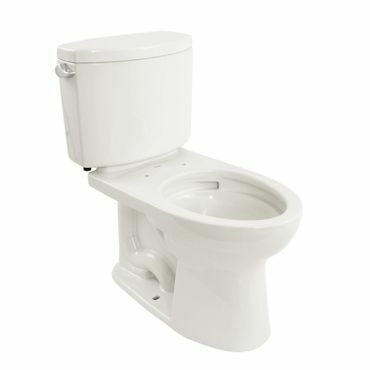 The Toto Drake II uses just 1.28 gpf, which is about 20 percent less than a standard toilet that uses 1.6 gpf. Its 3-inch flush valve is wider than most for a faster, more powerful flush. The Drake II's Double Cyclone flushing technology uses two nozzles instead of rim holes to add a powerful flow of water to every flush, which combines with gravity for more bowl-cleaning action. . In testing at ConsumerReports.org, it earns an Excellent score for bowl cleaning, Very Good for solid waste removal and owners say that they're impressed by how quickly and efficiently this toilet flushes everything in the bowl. We also spotted very few reports of clogs. It does seem to be a bit louder than other toilets -- it earns just a Good in that regard at ConsumerReports.org. Some owners also say it makes quite a "whooshing" sound when flushing. Comfortable height, sanitary coating. The Toto Drake II CST454CEFG has an elongated bowl and meets Americans with Disabilities Act (ADA) standards with a 16-inch bowl height, 17.25-inch seat height. Owners say this is a more comfortable height for average to tall users, but a few shorter folks say their legs dangle uncomfortably. Four of the Drake's available colors feature the CeFiONtect glaze, it's ultra-smooth and prevents waste from adhering to the surface -- black, however, uses the standard glaze.